Miss Taeko Komiyama, 13-years old girl, started to help her father to run a small hut at the top of Mt. 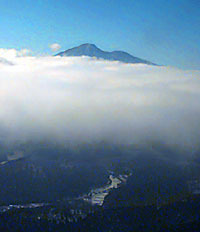 Kintoki (1,213m). She was happy until her beloved mountain guide father died in an accident when she was 18 years old. She decided to live alone in the one-room hut and serve Japanese tea for mountain climbers. A single girl living alone atop a Japanese mountain has one problem in common with a single girl living alone in a Manhattan apartment--men with idea. Whenever she encountered those men, she run away, climbed a tree and wait until they gave up, or otherwise she fought against them with Judo. She was a devout Christian and loved literature, although she practiced Judo for self-defense. She was loved by the mountain climbers as "Kintoki Musume (Daughter of Mt. Kintoki)". In the winter of 1954, a murderer under death sentence escaped jail and climbed the mountain with, he later confessed, the definite intention of "becoming famous by killing the famous Kintoki Musume". He burst into my house at night and before I knew what was happening, he was stabbing for my throat with a wicked-looking knife. I suffered some cuts before I was able to knock him unconscious. Then blood streaming from my cuts, I ran down the mountain to the village. This brave act brought her fame, and people talked about her, "She must be a reincarnation of Kintaro (Mr. Kintoki Sakata)", and loved her more than before. 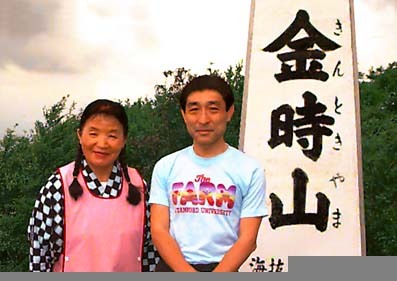 She is now 61 years old (see the photo), and still young serving Japanese tea to mountain climbers at her hut of Mt. Kintoki.